Patties Foods Ltd is conducting a recall of the below product. The recalled product has been available for sale in Coles, Woolworths, IGA’s, Foodlands and other independent supermarkets throughout Australia. 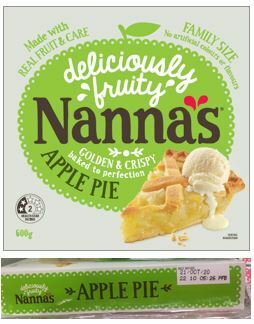 Problem: The recall is due to the potential presence of glass in an ingredient used in the 600g Nannas Family Apple Pie. This is a result of an equipment failure with the supplier. No other Nanna’s products are affected by this recall. Food Safety Hazard: Food products containing glass may cause injury if consumed. The company has initiated a recall of the affected batches as a precautionary measure. What to do: Customers should not eat this product. They should return the product to the place of purchase for a full refund.